In 1864, the closest Presbyterian Church was built at Cumnock. Church services were reached by sleigh in winter and by lumber wagons in summer by following the Indian Trail. An energetic former Metz school teacher organized the Metz community to build an Orange Hall which would be suitable for Sunday services, the Orange Lodge and other community events. 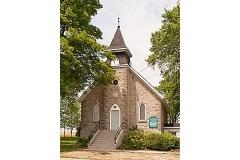 It was used until 1906 when they built their new stone church at a cost of $2600 on land donated by Peter McDougall. The official opening of the Metz church was held on November 25, 1906. In 1925, Metz became a United Church and was affiliated with Kenilworth. In 1967, a realignment with the United Church of Canada placed Metz with St. John's United Church, Belwood as a two point charge. The Metz Garden Party was a well known event for many years. This active rural congregation hosts church suppers, picnics, concerts and more recently their annual Pumpkinfest. A recent addition to the property is a gazebo to serve as a memorial for the church families.